I was going to do a Petty Superbird then saw a black one and got hooked. Have this kit as well as the Jo-Han kit. not sure what issue the Jo-Han is, as IIRC the original also had parts for a drag version. Did Plymouth do the real car in black??? Don't recall seeing one. TERRY'S Plymouth on Independence Blvd in Charlotte had 6 Superbirds well into late 1971. The had them marked down.....I told my Dad he needed to buy one.....Dad was not a car guy and called the car 'silly'. In the 1990's when a decent Superbird crossed the $100K mark I showed my Dad....not a silly car now!!!! 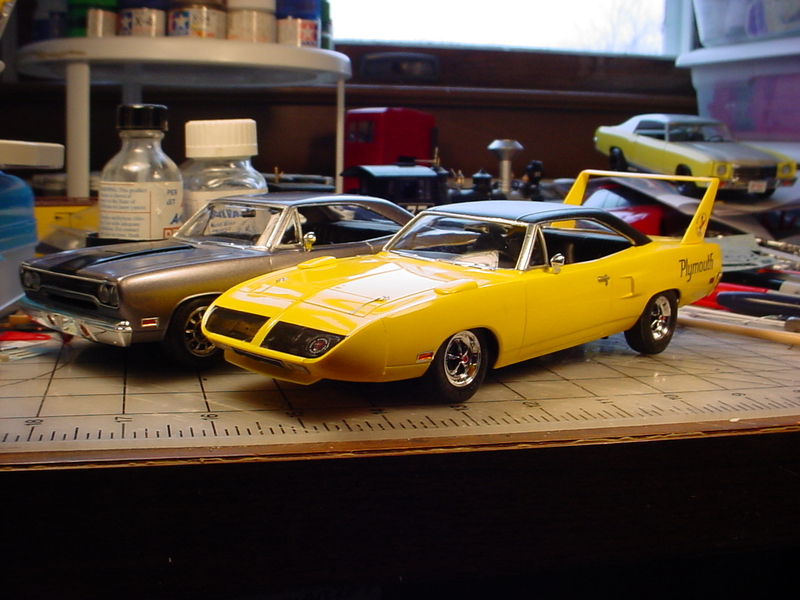 My yellow Superbird....I LIKE the kit. Thanks......the 70 is inspired by the 70 at the end of FnF Tokyo Drift. Most emblems were remove so not sure you'd call it a RR or GTX. There's, was, a guy in Massilon Ohio that had one in black. It was not an offered color on the Superbirds, his was custom.